This New GK Bakery Makes Salted Caramel Eclairs & Mango Mousse To Die For! 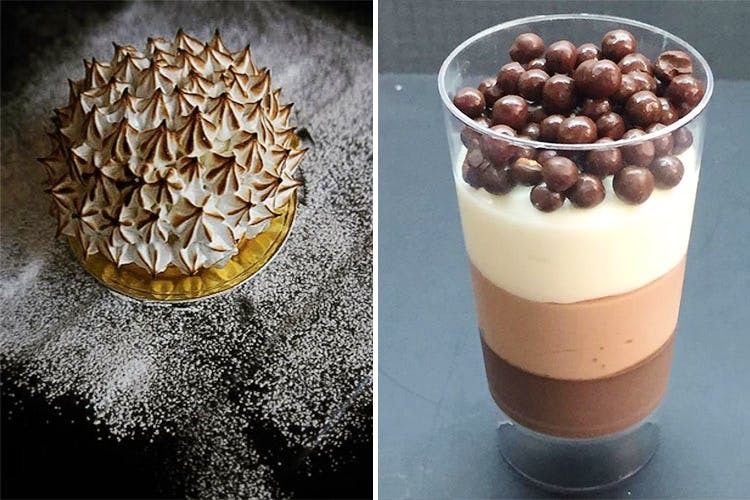 Dessertvala, a new bakery in GK, is doing classic desserts the way they're meant to be done, with no frills or crazy fusions - just good ol' desserts. A two-man show in the middle of GK1 M Block market, they're barely three weeks old but are already getting traction for their classic creations. What takes the cake is, in fact, not their cake but their éclairs. The chef, Dev, can take any flavour in the world and turn it into an éclair. We tried the coffee and salted caramel ones (and loved both). They're also doing the nicest carrot cake with a fluffy cream cheese frosting (we normally steer away from this, but this carrot cake was divine). Their mango mousse tastes just like a bite of summer -l ight and fresh, as is their yogurt panna cotta. If your go-to dessert involves chocolate, they’re doing a stellar mini-chocolate cake that you should try. They do various versions of cheesecakes, which they’ll turn into a cake for you on request (something they can do for most of their desserts, if you ask nicely). They plan on experimenting a lot and introducing interesting flavours like paan and many more.While you're there, try their lemon tart. It's simple, but the flavours are spot on. If you find yourself shopping in this area, pop by for bite and to pack some stuff for home later. It’s small but cosy, and perfect for a dessert date.